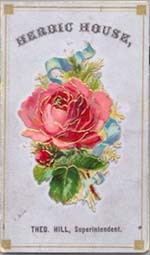 This is the cover to the 1874 Christmas Dinner menu at the Herdic House Hotel. The menu had many different items to choose from for the meal itself. To see the actual inside of the December 25, 1874 Christmas Dinner menu click here. 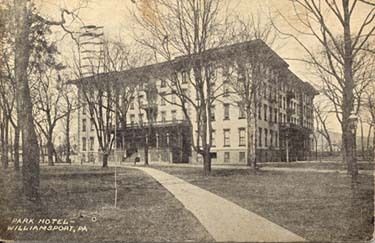 This is a post card of the Park Hotel that was sent buy a Hughesville woman to her children on October 6, 1901. 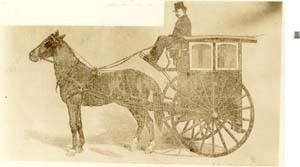 Not only was Peter Herdic known in the Williamsport area, he was also known in Boston, Philadelphia, New York, and Washington for inventing the horse-drawn carriage that was used in those cities as a taxi. It was called the "Herdic" and Peter Herdic himself is the only local citizen who has added a word to our English language.